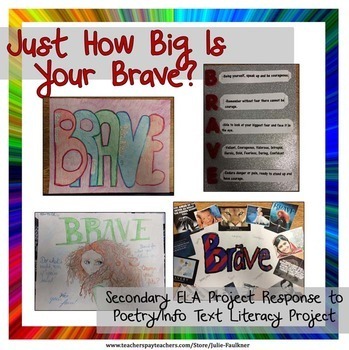 This paired text lesson juxtaposes pop culture's song "Brave" and Malala Yousafzai's "Speech to the UN" in order to spark a deep discussion and analysis of theme development across texts. 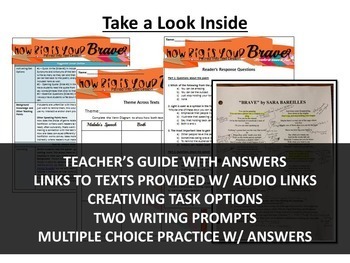 Its ultimate goal is for students to be able to delineate how theme develops and how two different texts can share the same theme. With a current speech and modern song as the two texts, students will be able to make connections and see relevancy to their world as well. 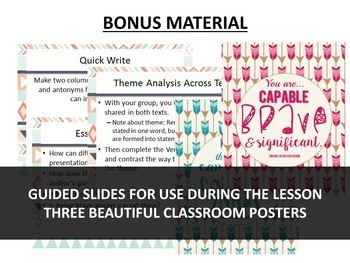 ♥ "Excellent resource! This fits right in with our character development program (this month it is Anti-Bullying), and some of my kids are reading I Am Malala right now. I appreciate how it fits into the Common Core, as well. Thank you!" ♥ "This will be a great addition to my Women Who Changed the World course. Thank you." 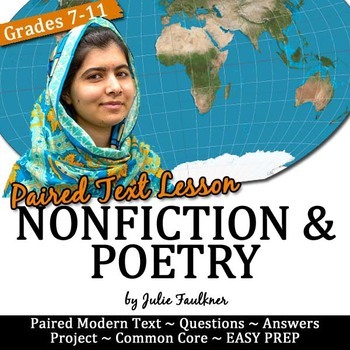 ♥ "I love your lessons with paired texts. I used this in conjunction with reading the novel The Breadwinner with 7th graders. The multiple choice questions were a bit tough for my groups and I had to modify the essay at the end. Overall, my students loved the texts and made many connections to the novel and the THEMES that all 3 shared." ♥ "We used this to teach our speech unit in 7th grade. The kids were so interested in her life that I could have easily made a whole research unit about her." ♥ "I absolutely LOVE this! Thank you for a Unit that is creative, yet still academically rigorous!"